Often adult mosquitoes emerge from areas not well suited for or too expensive for larviciding. When these mosquitoes will impact people, adulticiding measures will be implemented. Years ago, mosquito abatement districts used thermal foggers to create space sprays for subjecting mosquitoes to toxic doses of a pesticide. 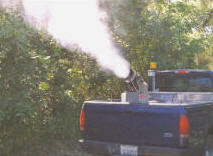 Thermal foggers essentially burn a concentrated pesticide diluted with a petroleum oil to create a thick smoke. Today's foggers use alternative technologies that don't emit hydrocarbons as they produce the tiny particles (as in smoke) necessary to kill mosquitoes, while at the same time using small amounts of pesticide. When large areas require treatment, an aircraft can be used to cover a vast area with an insecticide. In this situation the district contracts with an ag aircraft service. These specially skilled pilots are trained to make applications to agricultural areas. 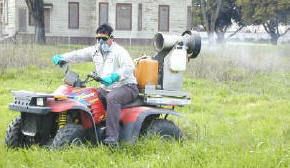 If the need arose to spray over urbanized areas, as in a serious disease situation, special arrangements have to be made. Contact between the pesticide particles and the mosquitoes is necessary to kill the insects. Therefore weather conditions play a critical role in achieving good results. Fogging in a light breeze causes the pesticide particles to drift, allowing contact with more of the target insects. Waiting for a temperature inversion keeps the particles from floating upward into the atmosphere, out of the spatial layer mosquitoes fly in. Materials designed for use in ultra low volume foggers are released within particle size boundaries of 15 - 50 microns, so they remain suspended in the air for longer periods of time (A human hair is about 300 microns in diameter.) This also leaves more particles in the target mosquito zone. All of these factors allow for less pesticide use while still producing desired results. Choices for pesticide use depend on many factors. The product label specifies the site types where the product can be applied.